The party sets off in search of the missing merchant with few leads. They end up outside of town in the thick of problems larger than themselves. Did they accidentally destroy Stromdorf? Lets hope not. I’ve been reading the adventure and it feels a bit like Jesse was cheating with his knowledge that Foaldeath is a beastman. I think there should have at least been a roll made to see if he recognized him as a beastman rather than as another inbred Holtz member. Also, I’m noticing that the GM has left out a lot of the more expository dialogue from different characters that reveals plot points or offers clues. Is this in order to make the mystery more difficult to solve? You know i had a hard time juggling how to handle my knowledge of the adventure and my PC perspective with Foaldeath. The way i’ll defend my actions are as follows: My PC was already on edge going into the forest, and upon arriving at the ‘death tree’ which obviously displayed signed of Beastmen activity (which i am very familiar with being a Wood Elf) and the sudden appearance of a monstrous humanoid creature, i decided it was in my ancestors best interests to shoot first, and not ask questions (which happens to be the action card i used). Regarding leaving out content from the adventure, i think we caught the GM off guard and ventured into unplanned territory. He was playing most of this adventure off the cuff and we derailed it quite a bit i think =). I can totally understand your motivations for that. I think my instinct on it had I been GMing (and I’m currently playing armchair quarterback, so who knows what I’d have done in the moment!) would have been to have you make a roll for whether your character would put together that it’s a beastman. I think that actually leads to an interesting discussion on what the GM should do if he has a question about whether a player is metagaming/playing their character “correctly.” Is it okay for a GM to tell a player not to start checking around brothels or pleasure houses after seeing a symbol of slaanesh on an enemy that the character would not know the meaning? Or is it the player’s job to reign in his character’s behavior? Would I have been stepping on your toes if I’d told you to make a Folklore/Nature Lore check to identify Foaldeath before allowing you to shoot? This brings up some of the more difficult to resolve player/GM conflicts. What do you do when the GM and player disagree about how a character should be roleplayed? On the one hand, the PC belongs to the player and it’s his right to play him how he chooses. On the other hand, if the GM is basing his story around his knowledge of the characters and their actions, is it wrong for a player to go against those? Is there a difference between a player not roleplaying his established character in the story and a player not rolling the stats written on his sheet? Hi, I don’t want to be rude and change the topic but after following your adventures for quite some time and being a fan of Warhammer Fantasy Roleplay I have a question. Do you as I suppose speaking not German as your mother language know that in the Fantasy Flight Games books one name of an NPC is some how wrong? Waltrout Glöckinger in case of The Gathering Storm or Gudrun the innkeeper from The Horror of Hugeldal Ensslin. Both are human males but the first names are old German female names. Like your grandma’s name. So, for a German it is just fun reading the adventures and at least my group enjoys keeping the names has they are because by using them we laugh our brains out during the sessions. I just wanted to check if you know. So, keeping going with your live play session I am a big fan! I was aware that the warhammer universe has a lot of fun with names, but rarely do I know when to pay attention to them since they are often in a variety of languages (as you pointed out). I usually have to rely on other players like yourself to point them out. I find them very humorous. I particularly like the ones which look normal when you read them but when you say it out loud it sounds totally different and related to some pop culture thing. I’ve heard stories about games that use foreign language names (such as German) for things in order to make them sound cool, but when the game gets translated or read by a native speaker, the name actually means something dumb. Like if I named a town in my game Todtotenblut in my game it sounds cool enough but actually means “kill death blood” in German, which is kind of stupid. I think the Kislev Thug from winds of magic, or the Estilean Diestro form the gathering storm have similliar jokes in their names. Maybe a natural speaker can clear them up. Playing this myself at the moment, I would love to see where the GM takes this from here… Btw, I think the adventure derailed mostly because of bad choices at the very beginning: Making up a party by chance is fun, but the elves just really lack the motivation and outlook to play this adventure, I think. A party of morally more ambigous humans might have taken the bait from Foaldeath. For years, I have been creating partys without too much chance, with a view of the tasks ahead in mind. Works betterfor me. We are on the so called “summer break”. One of our members was taking a major test over the last few months and requried is to put the gaming sessions on hold for a while. We are scheduled to have our next game in a little over a week and should be back on a normal schedule again. Regarding your thoughts on the race choices we are using for the Gathering Storm, i think i tend to agree with you. We have certainly thrown Chris (the GM) a huge curve ball with this one. Though if anyone is up to the task, I know he is. Though i must say i dont feel that bad, since many of us are already familiar with the basics of the adventure, having it slightly derailed makes for a new adventure for all of us while still remaining mostly loyal to the source material. I think throwing the GM curve balls due to the random races is like the best part of the game! Otherwise it’s just a standard adventure that everyone has already played. I mean look how entertaining the sessions are turning out because of it. Good to hear it is just a summer break. I’m on my 5th session GMing TGS with 3 other guys using Fantasy Grounds online (players in California, Canada and Hong Kong) and just are hitting the Holtz episode. Listening to your play has helped me GM better. 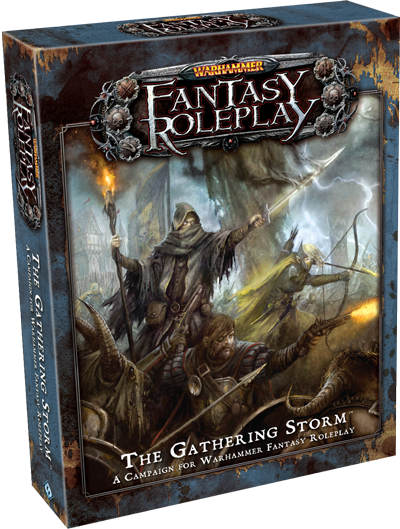 On another note – FFG just posted the official end of FFG development of the WFRP system on their website. Its sad, but won’t slow me and my fellow players any (I am also in a different group as a player)… I’ve listed to ALL your podcasts and I have to say, I think they are the best RPG live session podcasts I have run across. They have really helped me learn the system. You really hit a great balance of system introduction/explanation, engaging play, using the system as designed and don’t have the ‘annoyances” many other podcasts do (like the player who is laughing and joking so constantly that play is disrupted, or very poor sound quality, etc etc). You guys (and girl) are great! I’ve also been delving into Edge of Empire. Loved the idea of using the dice system in the Star Wars universe and its been kind of the new hot system…but I’ve got to say, I think the best elements of WFRP (the “parent” system) were discarded in the EofE system, and I just don’t enjoy it nearly as much. The perceived safety of the players, the lower key of “bad stuff” that can happen and thus the missing tension. The strain system just doesn’t work as well as the WFRP strain/fatigue system. The codifying of how to interpret advantages and setbacks generically actually seems to be counterproductive, as it encourages players to just play the dice and not roleplay the result. The lack of a social combat system (or all the social actions). The lack of the richness of action options, and the lower detail on how to interpret dice in actions in an action specific way. Anyway, its got me thinking I should just directly translate the WFRP system into the Star Wars universe! (which I know wouldn’t really work). Anyway, my point is I think it is a great system, and your podcasts have really helped me get to my appreciation of it. Thank you so much, and can’t wait for you to be back! !